The Lightning and the Sun is a 1958 book by Savitri Devi Mukherji, in which the author outlines her philosophy of history along with her critique of the modern world. The book is famous for its author's claim that Adolf Hitler was an avatar of the Hindu God Vishnu. A shortened/abridged version was published by National Vanguard Books. Resistance Records released an audio recording of readings from the book. An unabridged version was also made available online by the Savitri Devi archive. Most recently, an unabridged version was published by Counter Currents publishing. 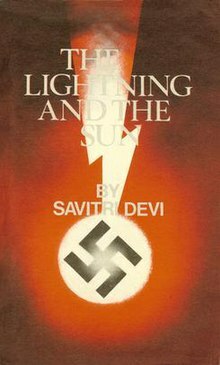 In The Lightning and the Sun, Savitri Devi Mukherji attempts to weave National Socialism with a cyclic view of history, arguing that time begins with a Golden Age and gradually decays through a Silver Age and Bronze Age into a final Kali Yuga, or Dark Age. She elucidates her concept of "Men in Time," "Men above Time," and "Men against Time" using the lives of Genghis Khan, Akhnaton, and Adolf Hitler respectively. Genghis Khan is used as an example of a "Man in Time" who exhibits Lightning (destructive) qualities and furthers historical decay. Akhnaton is used to illustrate a "Man above Time" who exhibits Sun (creative/life-affirming) qualities and seeks to transcend the process of historical decay. Adolf Hitler is used to illustrate a "Man against Time" who exhibits both Lightning and Sun qualities (destructive power harnessed for a life-affirming purpose) and seek to fight historical decay by using violent, Dark-Age methods to achieve a Golden Age state of existence. In the final chapter of the book, Savitri Devi expands further upon her cyclic view of history and argues that at the end of the Dark Age, Kalki will appear and usher in a new Golden Age. Begun in 1948, completed in 1956, and first published in 1958 in Calcutta, she said it "could be described as a personal answer to the events of 1945 and of the following years." It is dedicated "To the god-like Individual of our times; the Man against Time; the greatest European of all times; both Sun and Lightning: Adolf Hitler, as a tribute of unfailing love and loyalty, for ever and ever." It opens with quotations from The Bhagavad Gita and Rudolf Hess.